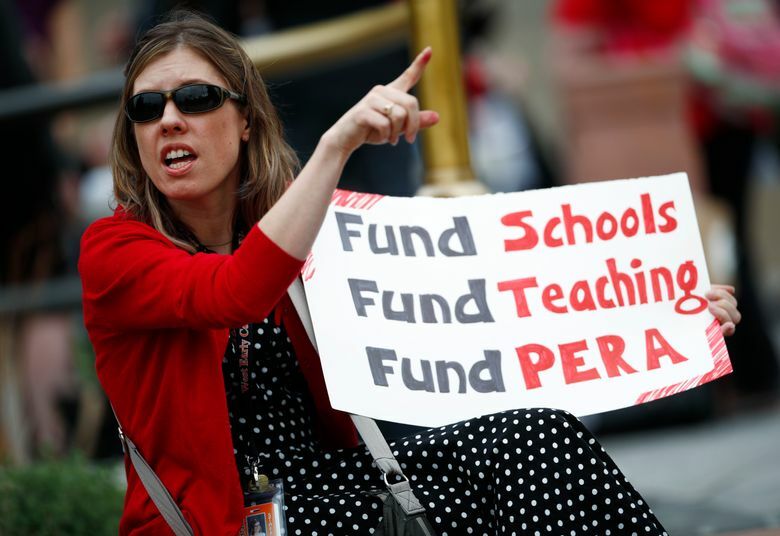 DENVER (AP) — Hundreds of public school teachers swarmed the Colorado state Capitol on Monday, shuttering one suburban Denver school district to demand better salaries, as lawmakers were set to debate a pension reform measure that would cut retirement benefits and take-home pay. 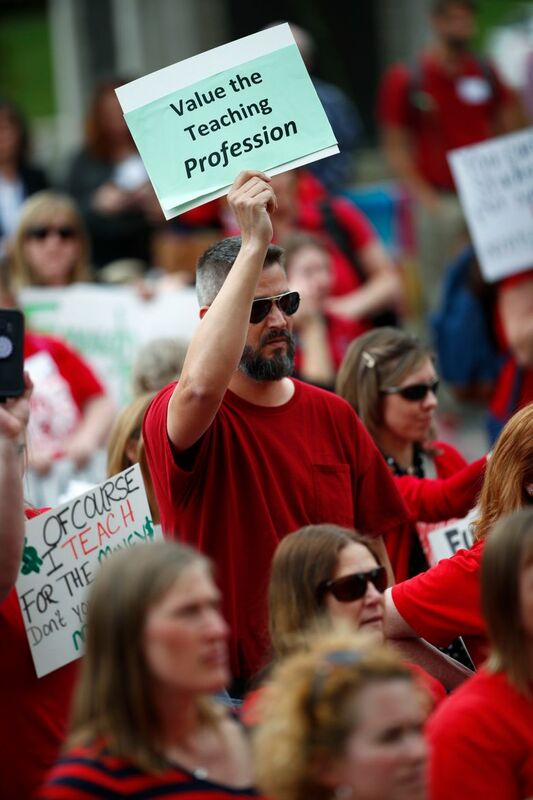 With the demonstrations, Colorado educators join peers in West Virginia, Oklahoma, Kentucky and Arizona who have staged strikes or high-profile protests in recent weeks to draw attention to what teachers unions see as a growing crisis in the profession. In Colorado the need is especially stark – and apparently at odds with a state economy that ranks among the nation’s best. The average teacher salary – $46,155 in 2016 -ranks 46th among states and Washington, D.C., according to the latest figures from the National Education Association. 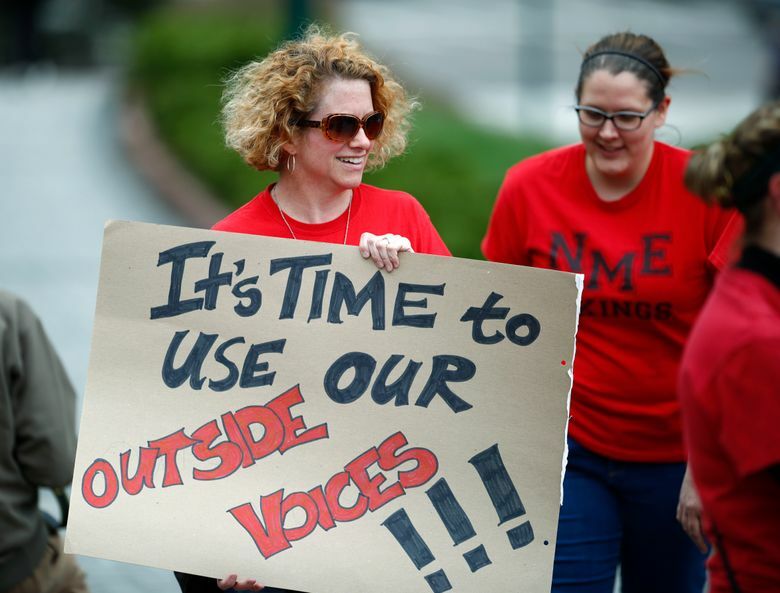 Teachers rallied in and outside the building Monday, holding signs and chanting slogans including “You left me no choice. I have to use my teacher voice.” They drew honks from passing cars before heading inside, where their cheers and songs resonated throughout the Golden Dome, drawing lawmakers out of their respective chambers to investigate the noise. 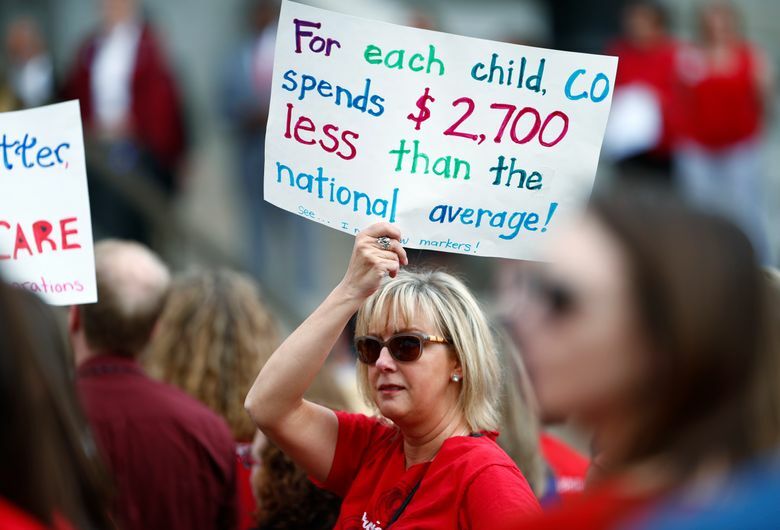 Washington, D.C., native Callie Gonyea, who is in her second year teaching at Ellis Elementary School in Denver, said she was surprised to learn that Colorado spending was so far below the national average given the number of people moving to the state and the millions of dollars raised in taxes on legalized marijuana. Gonyea said she would like to see more funding to pay for mental health treatment at her school, which has one full-time psychologist. She said her class alone has three students who would benefit from daily check-ins with the therapist. 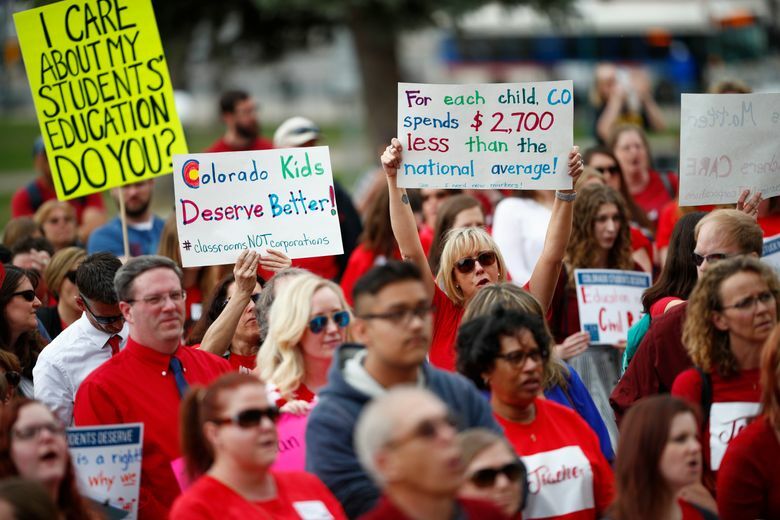 While recent teacher protests have come in firmly red states, Colorado has a Democratic governor and a Legislature split between Democrats and Republicans, but it has some of the strictest spending limits in the country thanks to a constitutional amendment passed by voters in 1992, and all tax hikes require voter approval. Education advocates have filed statewide ballot measures this year to raise revenue for schools, but past attempts have repeatedly been rejected by voters. It’s not clear if Colorado’s activism could be a sign of protests spreading to more Democratic-leaning states. There are two blue states are in the bottom half of per pupil spending with Colorado — California at 35 and Oregon at 36. 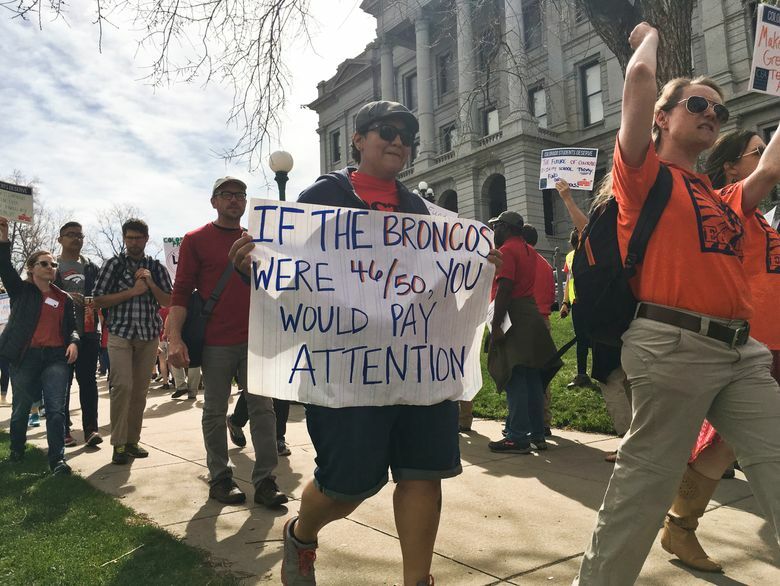 Monday’s demonstration was organized by the state’s largest teachers union, the Colorado Education Association, which estimated the morning crowd at 400. Englewood Schools Superintendent Wendy Rubin said that over 70 percent of the district’s faculty was expected to be absent so classes were cancelled Monday. 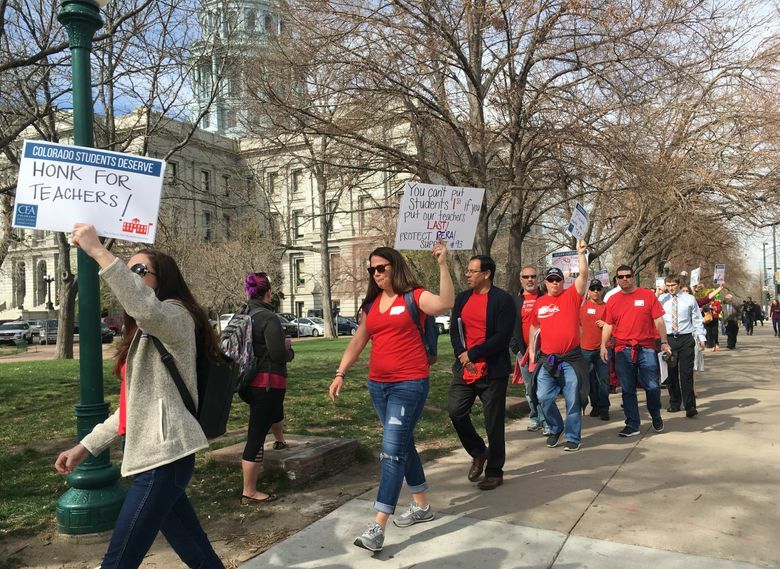 School funding has been at the forefront of the state’s spending fights for years, but organizers said this year’s lobbying day drew additional interest in light of recent demonstrations across the country. Democratic lawmakers cheered the protests on Monday, stopping to pose for selfies with the teachers. 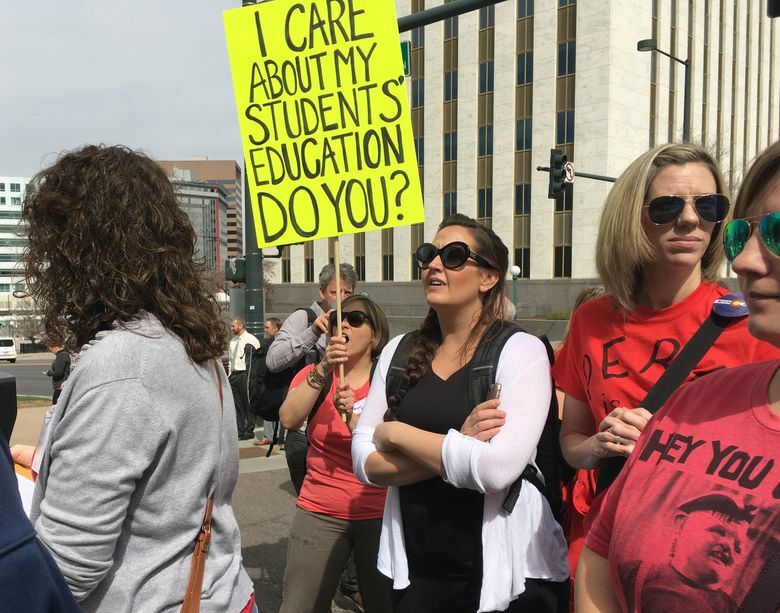 But Republicans questioned the timing of the demonstrations in a year that lawmakers are expected to increase K-12 funding by the largest amount in recent memory. Colorado currently underfunds its schools by $822 million annually, pinching rural areas in particular, where school districts face teacher shortages. Lawmakers in next year’s budget plan to “buy down” the annual amount owed to schools by $150 million, and boost per-pupil spending by 6 percent. 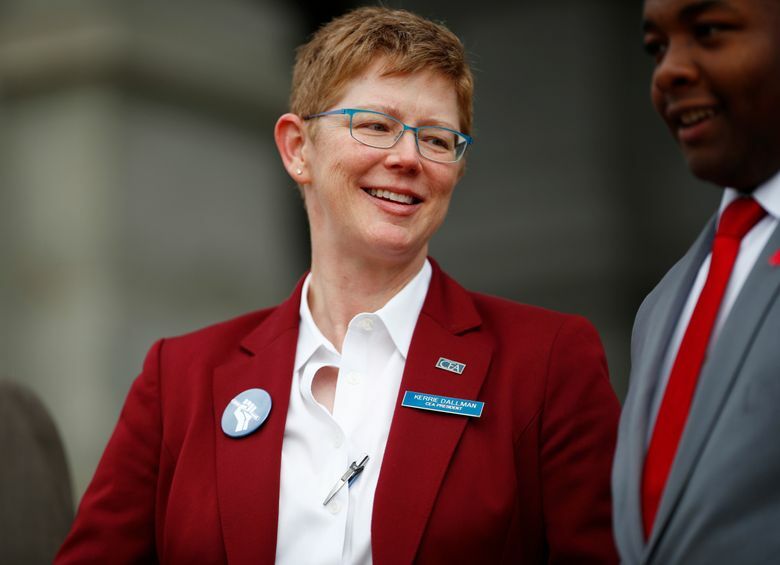 It’s unclear if the additional funding will result in lasting raises in the poorest districts, where superintendents complain of losing teachers to places like Walmart. 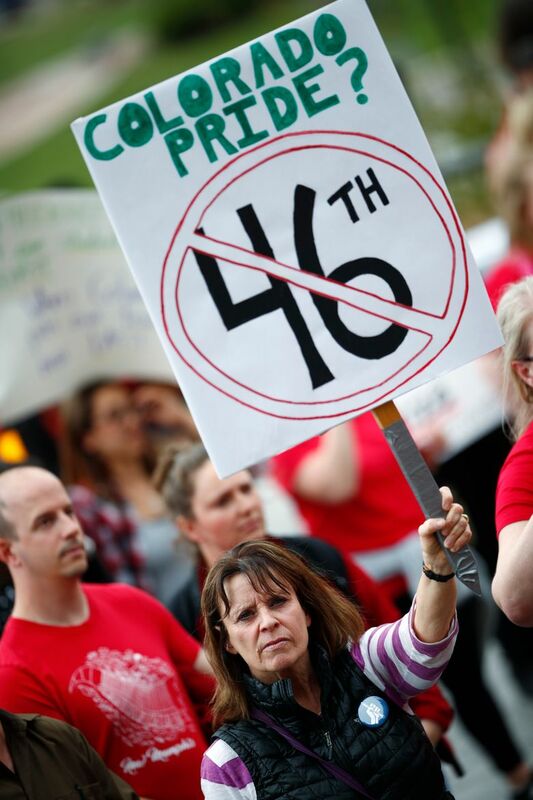 A sweeping pension reform effort moving through the Legislature could require districts and teachers alike to contribute more to the Public Employees’ Retirement Association, which faces an unfunded debt of at least $32 billion. And a property-tax limiting provision of the state constitution is expected to trigger cuts to local school funding in 2019. Colorado recently ranked 40th in spending per student according to 2013 figures from the National Center for Education Statistics compiled by the Colorado School Finance Project.